A man has nightmares of an impending invasion. His wife thinks he needs help, but when an invasion actually does occur, his family is left fighting for survival against an unknown attacker. What happens when your dreams turn out to be much more than fantasies? 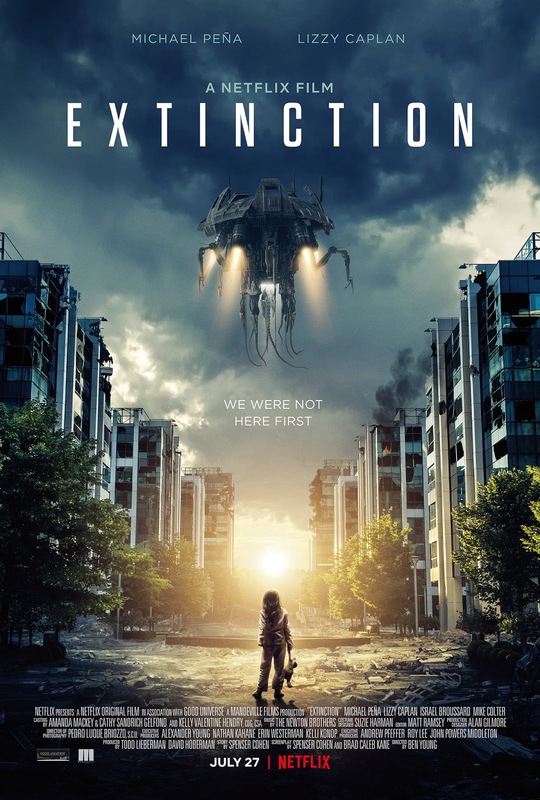 "Extinction" is directed by Ben Young, who has one other feature film directorial credit, the 2016 film "Hounds of Love." The screenplay is written by Eric Hauser, who is best known for writing the films "Arrival" and "Lights Out." The screenplay is adapted from a Black List script by Spenser Cohen and Brad Kane. 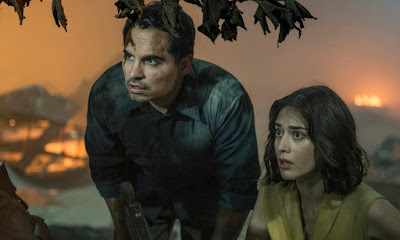 The story focuses on a man named Peter (Michael Pena), his wife Alice (Lizzy Caplan) and their two daughters Lucy (Erica Tremblay) and Hanna (Amelia Crouch). Peter has been having nightmares where he sees invaders attacking the planet as he watches the people closest to him dying all around him. Alice keeps begging Peter to get some help and see a doctor, but when he meets another man at the doctor's office who is having the same nightmares, Peter thinks the coincidence is too much to ignore. When an invasion actually does happen one night, it leaves him and his family fighting for their lives as they look to him for guidance throughout the attack and try to figure out who the enemy is and what they want. At the beginning of "Extinction," it feels like a B-movie re-imagining of "The War of the Worlds," and we don't mean the over-bloated Steven Spielberg version, but the 1953 Byron Haskin version. Though this is not a remake, it is hard to argue that it didn't at least partially inspire this flick. For the most part, we found this to be an engaging story and an enjoyable sci-fi action thriller. Every so often, there are times moments with great amounts of tension and moderate excitement. Some things about this film are very cliche, but there are other elements that at least try to do something clever and original. Some people may roll their eyes at the "twist," but we found it to be properly developed and captivating enough to at least make sense. It doesn't just come out of left field, which we appreciate in a genre oversaturated with gimmicky "gotcha!" moments. This movie doesn't have a huge budget and it certainly shows. Most of the effects are second-tier at best, and since we watched this film on the same day we re-watched "Sharknado," we couldn't help but notice some similarities in the graphics, which is never a good comparison. There are also some costuming choices that don't seem to make a ton of sense in the context of the story, many of which are used intentionally to mislead the audience. Most of the costumes feel a little cheap, and they look kind of cheap, too. "Extinction" isn't a groundbreaking sci-fi flick that will stand the test of time. The acting and direction are not notably good or bad. It's also not the kind of movie people will be watching for years to come. But, if you're bored one day and want to watch something for an hour and a half on Netflix that is at least halfway entertaining, there are worse choices than this. 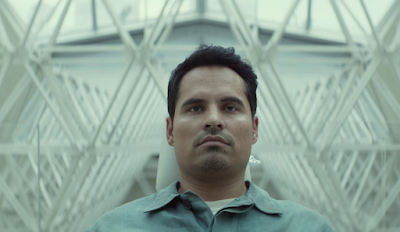 We can see why some viewers might not like this film, but it did enough to satisfy us.